The beginning of April has always signaled Spring to me. It doesn’t matter what the calendar says. We could have snow on the ground, but when I turn the calendar page and see April, I know Spring has finally sprung. A bit of green pokes through the brown grass, the daffodils and tulips send their spears up through the cold ground. April also signaled Major League Baseball’s Opening Day. Not anymore. The season is starting in March now. But I still think about baseball as April arrives. One of my favorite reasons for living in the Midwest is the changing of seasons. Not every place on this planet has the distinct seasonal changes that we have. What about other planets? The Goldilocks planets (places where it’s “just right” for humans) would have temperate climates as well as seasons. 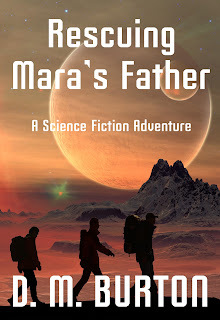 In my science fiction adventure story Rescuing Mara’s Father, the weather changes depending on where the action takes place. Hot days and cool nights are common in arid regions, while the higher into the mountains Mara and her friends travel the colder it gets. When I was in middle grades, adventure stories were no where near as plentiful as they are today. I’m thrilled that kids have so many choices. Stories that carry them to foreign lands or to alien planets expand their minds while entertaining them. That’s the point of my story. Widening kids’ (and adults’) imagination and entertainment. The first time D.M. Burton saw Star Wars IV: A New Hope, she was hooked on science fiction and space travel. The Star Trek movies made her want to travel to other planets. Alas, she is still Earth-bound. D.M. and her husband live in Michigan, close to their two children and five grandchildren. She writes adult fiction as Diane Burton, where she combines her love of mystery, adventure, science fiction and romance into writing romantic fiction. Besides writing science fiction romance, she writes romantic suspense, and cozy mysteries. “I mean it.” I fist my hands on my hips. “You are not going to tell me I can’t go. You can’t. I’ll be fifteen in three tendays. I’m going.” We’ve had a lot of arguments, but I’ve never defied him before. “You may be old enough to enroll in the Institute. You still need parental approval.” He lets that sink in. My words hang between us. My chest heaves. I clench my teeth, so I don’t start bawling. I can’t believe he won’t let me go to Tech. Worse, I can’t believe I blurted out the horrible thought that has been festering in the darkest corner of my mind for several tendays. I wait for him to tell me I’m wrong. That he does love me. That I am his child. Father slumps into the chair I abandoned. I’ve never seen such a look on his face. Like he’s been kicked in the stomach by a hican. For a sec, before he sat, I thought I saw something else in his eyes. Guilt? Couldn’t have been. He doesn’t care enough to feel guilty about forbidding me go to Tech. I’m ashamed of my outburst, ashamed that I revealed my worst fear—the fear that he isn’t my real father. We’ve argued before, but I always kept my fear a secret. Now, he knows. I can’t bear to look at him, to see reproach in his eyes. I race into my bedroom and slam the door. I force myself not to throw myself on my bed and cry. Anger at him for not coming after me. If he did come, he would probably tell me again how I don’t try, how I don’t measure up. I’m not sticking around for another lecture. I grab my jacket. My trousers are heavy, but the shirt won’t be enough in the chilly evening. I search under my bed for my emergency pack—the one Father insists I keep ready at all times, ever since the riots. I grab it and slip out the window. Automatically, I close it behind me so critters can’t get in. I don’t have a plan. I just know I don’t want to see Father for a while.